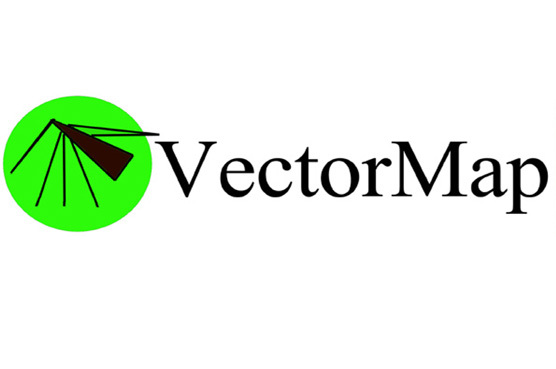 VectorMap is a product of the Walter Reed Biosystematics Unit based in the Smithsonian Institution. VectorMap provides disease maps, and mapped collection data and distribution models for arthropod disease vector species, including mosquitoes, ticks, sand flies, mites, and fleas, as well as the hosts/reservoirs of vector-borne disease pathogens. Collection records are searchable and downloadable, users can map and contribute their own georeferenced collection data or distribution models, and all contributions have full attribution. Currently, MosquitoMap has 360,531 records, TickMap has 86,513 records, and SandflyMap has 8,870 records. In addition, there are 8,725 flea records, as well as a smaller but growing number of chigger mite, mite-borne scrub typhus, and host/reservoir records. 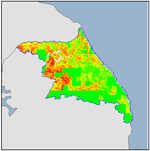 VectorMap is designed to preserve and make available the results of past collecting and distribution modeling activity, and to provide a unique resource for exploring possible disease risk factors. The utility of VectorMap will increase as more records and models are added. Contributions are encouraged, especially from individuals and organizations with digitized, georeferenced records and those involved in ongoing mosquito surveillance. 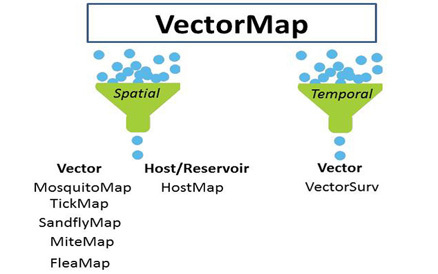 VectorMap is modeled on MosquitoMap - see International Journal of Health Geographics. For an introduction to georeferencing standards and procedures see Journal of Medical Entomology. identifying cryptic evolutionary lineages that differ in geographic or ecological space. A novel enhancement of VectorMap is the Mal-area calculator (MAC) that quantifies the overlap between vector and pathogen distribution models, and host (human) population. The co-occurrence of vectors, parasites and hosts are required for many vector-borne diseases, and the MAC quantifies this co-occurrence for a given area, thus potentially providing a map and simple index of disease risk for any area of interest. At the moment the MAC is at the 'proof of concept' stage, but we plan to roll out an operational version in the near future! An associated application in preparation is VectorSurv, designed to host longitudinal survey data for arthropod vectors. Data from trap sites that are routinely monitored, often over many years, provides a valuable resource for assessing disease transmission risk, and for identifying the climatic and phenological factors responsible for temporal changes in abundance. VectorSurv is designed for online input and display of surveillance data. View near real-time climate maps of relevance to vector borne disease. View map of the mosquito vector species of arboviruses of the world. 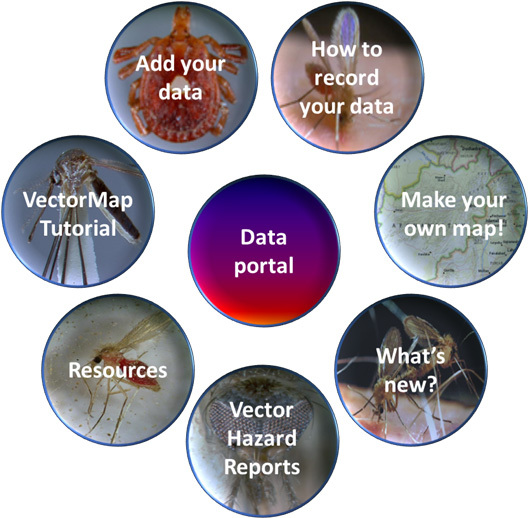 Funding for VectorMap was provided by the US Department of Defense Global Emerging Infections Surveillance and Response System(DoD-GEIS), a Division of the Armed Forces Health Surveillance Center, and from the Global Biodiversity Information System (GBIF). Comments and questions should be directed to VectorMap. Website updated on 12/23/2018 21:56 .